As you develop and deepen your personal relationships with your constituents, the need to manage constituents as individuals increases. Making the decision to track your constituents as individuals hinges on the ability to effectively manage relationships. LGL provides a simple yet flexible way to create relationships between constituents. This will bring up the Relationships form, to which you can add one or more entries. If you ever need to edit a relationship, just pull up this form, rename the values describing the relationship, and then save the form. This Knowledge Base article on employee-employer relationships explains another type of relationship you might want to track in LGL. 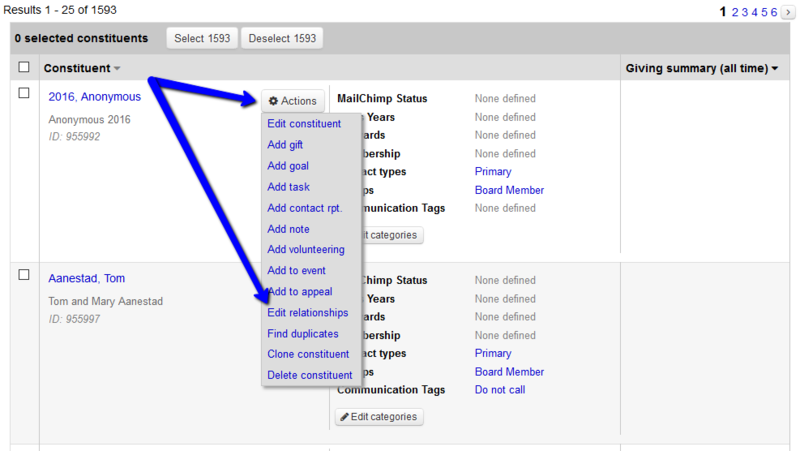 Then click Save to update the constituent record and remove the relationship. You can share address and phone number information from the primary record to the related record. Shared contact information will automatically appear on the related constituent's record, and it will be updated whenever you change that information for the source constituent. 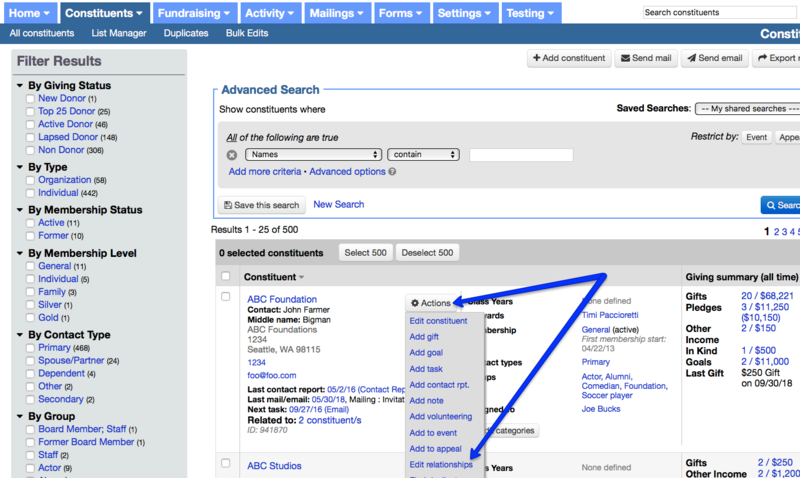 When entering a gift for a constituent that has related records associated with it, you can choose from a drop-down menu of related constituents to add a related gift. Note: If the constituent to whom you'd like to add a related gift is not yet in your database or is not yet related to your donor, you can choose to add a new constituent or find an existing one. Once selected, you can choose what type of related gift you'd like to add (soft credit, in honor of, in memory of, or matching). Read more about related gifts.